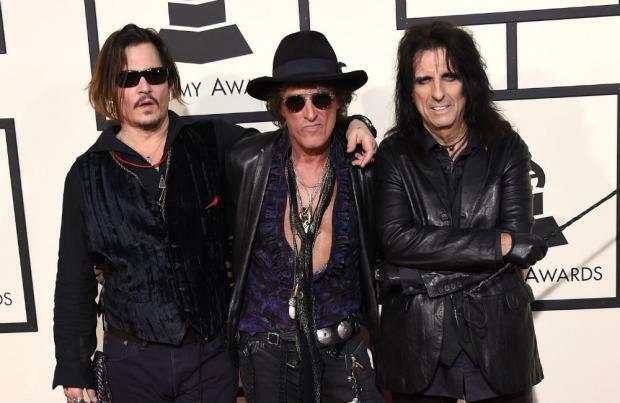 Alice Cooper has praised his Hollywood Vampires bandmate Johnny Depp as a "real guitar player". Rock legend Alice, 70, Johnny, 54, and Aerosmith axeman Joe Perry, 67, are bringing their super-group to the UK this summer with concerts in Birmingham, Manchester and Glasgow this June, topping off the short run at London's The SSE Arena, Wembley on June 20. The trio will be joined by The Darkness and The Dammed at the four concerts and Alice can't wait for fans to see what Johnny can do with a six-string in his hands, because he's much more than just his 'Pirates of the Caribbean' character Jack Sparrow - an alter ego which he based on Rolling Stones rocker Keith Richards. Speaking to the London Evening Standard newspaper, the 'Feed My Frankenstein' singer said: "He's as good as anyone I've played with. He's not new to playing on stage. People are going to be very surprised because they know him as Jack Sparrow. They're going to say, 'I didn't have any idea he could play like that.' He's a real guitar player. I wouldn't be working with anybody that wasn't as good as anybody I've worked with normally." The Vampires began on Hollywood's Sunset Strip at the iconic Rainbow Bar & Grill's upstairs bar, which over the years has featured the likes of the late John Lennon and The Who's Keith Moon and they released their self-titled LP in 2015, which featured guest appearances from Sir Paul McCartney and Foo Fighters' Dave Grohl. Alice - who has released 27 studio albums over 56 years - admits that when they started out Johnny may have been nervous because of his bandmates illustrious music careers, but that soon went away. He said: "Joe can do Aerosmith all day. I can do Alice Cooper all day - I think Johnny might have been the most nervous. Once you get in front of the audience though that goes away." Johnny's reputation for being an excellent guitar player has been steadily built over the years with him performing with The Black Keys, Marilyn Manson, Ryan Adams and Oasis. The actor also provided slide guitar on the Oasis track 'Fade In-Out' on their 1997 album 'Be Here Now' after being invited to play on the LP by Noel Gallagher, who he was close friends with at the time due to their respective relationships with Kate Moss and Meg Mathews.